Oscar was born in Lleida, Spain and played professionally in the Spanish National 3rd Division for seven years until he moved to the United States in 2010. During his career, Oscar played for several teams in the Catalonia and Aragon regions of Spain. 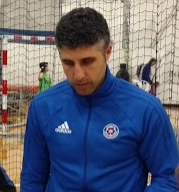 Oscar has a vast background in youth development with over 15 years of coaching experience. During his coaching career in Spain, Oscar worked alongside some of the most recognized soccer coaches in the world, including the former director of the F.C. Barcelona Youth Academy Albert Benaiges, and former technical manager of the Liverpool F.C. Academy and current General Manager of F.C. Barcelona, Pep Segura. Oscar has a Master’s Degree in Sport Science (soccer specialization) and a Bachelor’s Degree in Physical Education from the University of Lleida (National Institute of Physical Education of Catalonia, Spain), which is the highest soccer degree you can obtain in Spain through its education system. · 2018: National USSF “A” Youth Coaching License, United States Soccer Federation, USA.